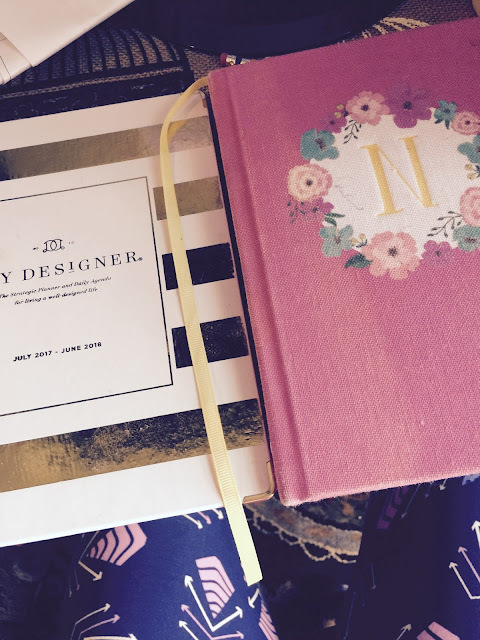 I thought I would share with you my favorite ways to stay organized while working from... It's been over four years since I started work from home life. I've found several ways to keep myself organized and focused throughout the week. This summer, I picked up a chalkboard from Hobby Lobby and hung it up on my wall next to my desk. What do I put on my chalkboard? I have 5 to 7 things I have to accomplish in that week. I might also write specific notes about the accounts I'm managing or the stories I'm writing for the paper. I want those important tasks out there for me to notice when I sit down at my desk in the morning. I love checking things off my list throughout the week. Of course, I have to have a weekly/monthly planner... I like simple planners. I bought mine from Target for $12. I had a bigger one from Michael's, but I didn't like how big it was. I like being able to carry it with me when I go out. I write down everything from due dates for stories to the topics I'm posting in my accounts four times a week. My planner doesn't provide enough room for my work notes so I have a small notebook I can take wherever with notes I need for work. When I'm working at my desk, I have this pink notebook open to my accounts page along with another page where I wrote specific things I need to remember. A decorative bowl on my desk I got from a flea market holds my pens, pencils, red pens for editing and random chapstick I need throughout the day. I hate having writing utensils spread all over my desk. I love having them all in one place. A cork board with my favorite pictures doesn't help my organization, but it does brighten my day to see my pictures when I sit at my desk. My mom has pictures at her desk and swaps them out every 4 to 6 months. I'm planning on reorganizing my pictures and swapping some out soon. What do you do to stay organized while working from home? I would love to hear your tips.